Public Employee Unions and private sector Unions have far too much political influence compared to their size. And that political influence is bought through the forced Union dues paid by many people who are diametrically opposed to the political goals of those Unions, like the Ohio teacher who had her Union dues spent to fight her husband’s political candidacy. Her husband won the election, despite the Ohio Education Association stealing her money and then using that ill gotten booty to attack her husband. Do Unions forcibly take Union dues away from people who do not want to be in the Unions? Yes, they do. Do those same Unions then spend those Union dollars on political campaigns many of their members vehemently oppose? Yes, they do. And it’s sinful and tyrannical. Now, how big are the unions? Not very big when compared to the rest of the people. The Federal Bureau of Labor Statistics spells it out rather clearly in its January, 2012 summary. In 2011, the union membership rate–the percent of wage and salary workers who were members of a union–was 11.8 percent, essentially unchanged from 11.9 percent in 2010, the U.S. Bureau of Labor Statistics reported today. The number of wage and salary workers belonging to unions, at 14.8 million, also showed little movement over the year. In 1983, the first year for which comparable union data are available, the union membership rate was 20.1 percent and there were 17.7 million union workers. So, less than 12 percent of America’s workers are members of Unions (and I already pointed out that many of those Union members are unwilling members but were forced to be members against their will). But the news for the American public is much worse than that. A reasonable person would tend to believe there are more private sector Union members than public sector Union members simply because there are vastly more private sector jobs than public sector jobs. That reasonable person would be grossly in error. From the same Federal Bureau of Labor Statistics report comes the data. Of the 14.8 million Union members, representing a mere 11.8 percent of the workforce, 7.2 million are in private sector Unions while 7.6 million are in public sector Unions. 51.4 percent of all Union members have public sector jobs while only 48.6 percent of all Union members work for businesses. That means Public Employee Unions represent 6.06 percent of all people in the workforce, or barely over 1 in 20 employees. And yet, as the chart on the right, from Open Secrets, shows, Public Employee Unions are among the absolute biggest political spenders in the nation. And they’re almost monolithic in their support for the Democrat Party (as opposed to businesses, which are far more balanced in their political spending, and spend far less money in politics). The top 4 highlighted groups on that chart are Public Employee Unions, and the 5th highlighted one is a group of Unions that contain both PEUs and private sector Unions. That, alone, would show an over-stated position of political power compared to their relatively small size. But this isn’t about just the Public Employee Unions. It’s about all the Unions. So take a look at that chart of the biggest political spenders again. For Unions to be proportionately representative, they would need to have only 15 of the top 140 biggest political spenders, and yet they have 14 of the top 30 and 15 of the top 40! Unions represent 29 of the top 140 biggest political spenders, or just over 20 percent. From 1989 to present, Unions in the top 140 biggest political spenders have spent a combined 667,321,417 dollars on politics, and almost monolithically Democrat/Leftist politics. The top 140 spent a combined 2,367,159,046 dollars on politics in that time period, meaning Unions spent 28.2 percent of the political money of the top 140, far in excess of their proportionate representation, even considering Unions’ 21 percent representation in 1983 (which has been steadily falling since then). Oh, by the way, that great evil, FOX News? 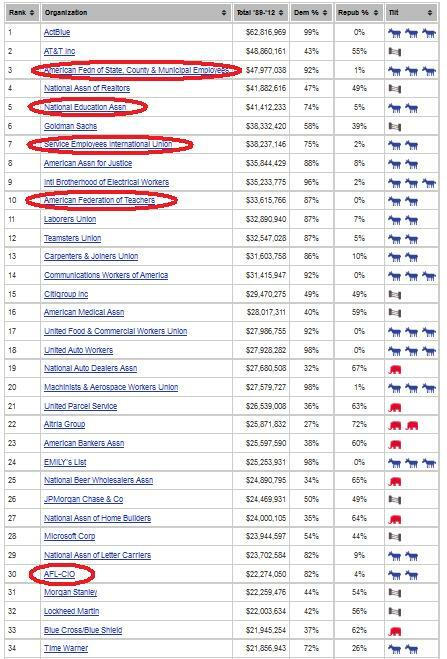 Its parent company is on the list, at number 81, with 51 percent of its political money going to Democrats and only 48 percent going to Republicans. But in Liberal la-la land, that means they’re in the tank for Republicans.